New Gretsch Catalina Club, Mod special series. 100% Mahogany, Sizes 8X12, 14X16, 20X22, 6.5X14 (10LUG, GREAT CRACK). Offset black powdercoated lugs. All Evans G1 Coated heads, SKII Muffled Bass Drum Head. 14" A Custom Hats, 20" A Custom Ride, 16" A Custom Medium Crash, 18" A Custom Medium / Thin Crash, 10" A Custom Fast Splash, 18" Sabian AA Fast China. All DW 9000 Series Hadrware, Double Pedal. I LOVE THIS SETUP. After playing in a Jazz Band, I started playing four piece sets, and now I play Ska, and with these sizes, I get great tone, clarity, and depth. A Custom Is the way to go! 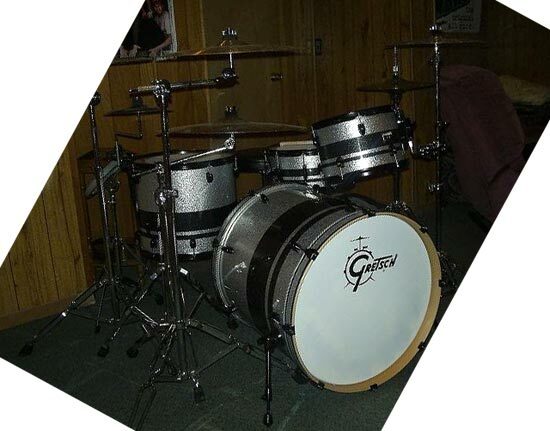 Gretsch surprised me with these drums, $700 For a shell pack, four piece, with great sizes for gigging rock players, and affordable custom features for a 16 year old player like me.